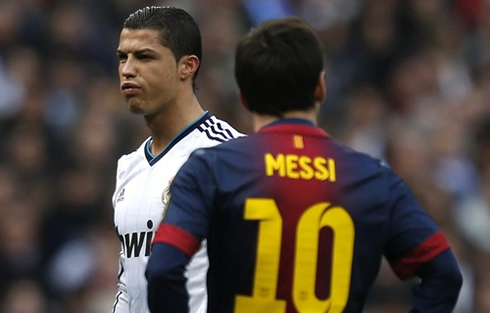 ﻿ Real Madrid 2-1 Barcelona. The defeat of the tiki-taka! 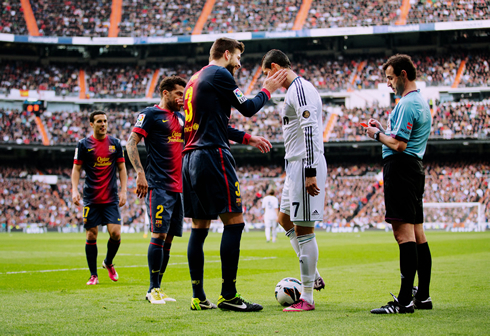 02.03.2013 » Real Madrid 2-1 Barcelona. The defeat of the tiki-taka! Real Madrid earned their second straight win against Barça this Saturday afternoon, in a 2-1 victory at the Santiago Bernabéu. Karim Benzema got the opener on the 6th minute of the first half, but saw Lionel Messi levelling things up still inside the first 20 minutes of the game. Cristiano Ronaldo was left resting on the bench until the 58th minute, but jumped in still in time to see Sergio Ramos getting the late winner, with a brilliant header from a Modric's corner-kick. José Mourinho knew this Saturday's match was far less important than next Tuesday's Champions League game against Manchester United. With that in mind, the Portuguese coach preferred to spare most of his key players, and went into this Clasico with some sort of a 2nd tier line-up. The biggest changes were Essien playing in the right-back spot, while Pepe, Modric and Kaká formed the midfield trio. As for the attack, Callejón and Morata took the wings and Benzema played as center forward. Barcelona didn't rotate their team as they don't have any mid-week game in a few days (they will only meet AC Milan the following week), and apart from Xavi who picked up an injury in last Tuesday's match at the Camp Nou, only Puyol and Fabregas from the usual starters lot, actually began the game on the bench. Morata's natural position (center forward) was filled by Benzema, forcing the Spanish youngster to play in a spot at one of the wings, in order to make it to the line-up. It was precisely from his feet that the Merengues built the play that led to the first goal. The 20-years old forward took on Daniel Alves on the left, before getting enough space to cross into the far post. His pass met Karim Benzema free of marking, who was left with the simply task of tapping the ball in, and to beat Victor Valdés for the first time on the afternoon. Barcelona had most of the ball possession in this Clasico, just as everyone knew they would. Their trademark passing gamestyle was not really allowing them to create many goalscoring chances and one of the few exceptions ended up resulting in the equaliser. Lionel Messi escaped Sergio Ramos marking after a great through pass by Daniel Alves, then went face to face against the Real Madrid captain and blasted a shot into the back of the net, tying the game with still plenty of time left to be played. The Blaugrana would end the game with a 67% ball possession stat, but as mentioned before, few were the times when they actually looked to be the superior side on the pitch. As seen in previous Clasicos, Barça's "tiki-taka" didn't seem to upset much Real Madrid players, who held back at their own half with patience, waiting for the right time to counter and catch Barcelona off guard. Mourinho kept Ronaldo resting until roughly the first quarter of an hour in the second half, but as he brought in the Portuguese super star, the game got its pace changed from that point onwards. The final result was set in the 82th minute, in a period where Real Madrid was already creating several good chances to beat Valdés, with Cristiano Ronaldo and his classic free-kicks in particular evidence. 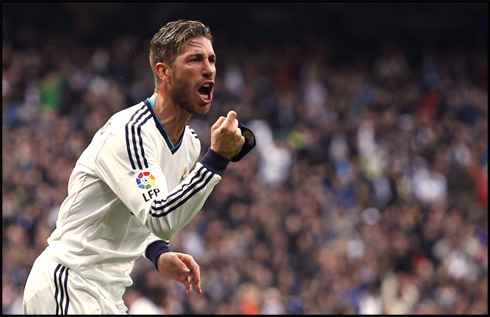 However, it would be from a corner-kick on the left side took by Luka Modric, that Sergio Ramos brilliantly deflected the ball with his head, allowing Real Madrid to regain the lead and applying the final blow to Barcelona. The Merengues captain elevated over Gerard Piqué on the first post and beat Valdés without even allowing him to put his hands on the ball. 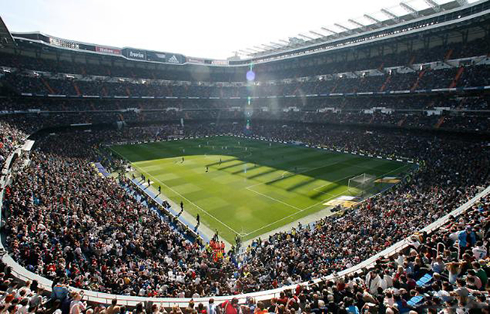 2-1 for Real Madrid and the certainty that the gap between the two sides on the Spanish League "La Liga" was cut to 13 points, with still 12 games left to be played. Coming next, a thrilling Manchester United vs Real Madrid live encounter at the Old Trafford, with Cristiano Ronaldo on top form and the promise of an electrifying game for this UEFA Champions League second leg. Cristiano Ronaldo next game for Real Madrid will be against his former team Manchester United, on March 5, 2013, at Old Trafford and for the UEFA Champions League. You can watch Juventus live stream, Manchester United vs Real Madrid, PSG vs Valencia, Aston Villa vs Manchester City and Tottenham vs Arsenal, all matches provided from our soccer live section.